I am always inquisitive about the lives of famous or interesting people and enjoy reading their biographies. For successful ones, I probe into why they can be so successful. For the non-successful ones, I seek to understand what causes their failures. I discover that successful people always have their own set of core values in lives. Not only will they not deviate from their core values over time, they also love reiterating their core values times and over again either via interviews or a normal conversation. Below are some examples of great people and their core values I assumed from what I read about them. Mark Zuckerberg : Mission, Care, Look Ahead. Refer here. Liew Mun Leong : Build core competence, Discipline, Focus, Patient etc. Refer here. So, here in this post, I will like to define my very own CORE VALUES in life. Instead of having long lists which is supposedly good, I do not want to be long-winded and hence simplify into THREE values of greater significance to me. Encircling these values will be “Love” or passion which is so commonly mentioned by all the great people. 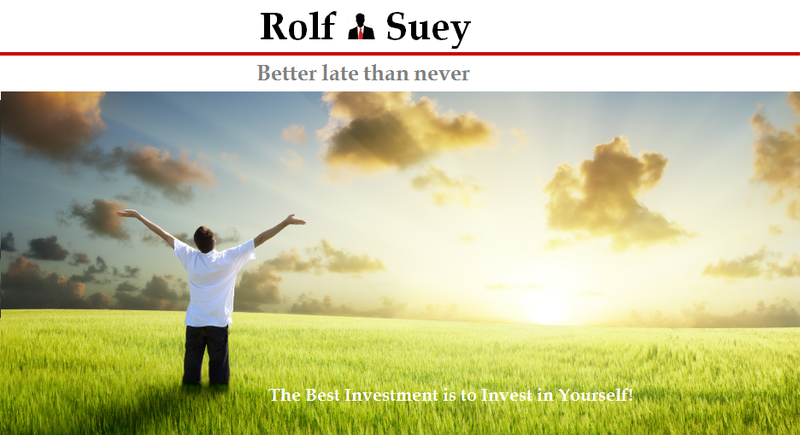 It is no doubt that this value is so important to me since even my Blog name “Rolf Suey” is all about finding your true self. “Rolf Suey” when letters re-arranged correctly is “Yourself”. It means digging deep down into your heart and soul to ask who you really are and what you really want. Passion is almost every successful person’s secret sauce to success. It is no different for me. Yet, it is so difficult to truly find the real passion. Unless you are born quite a genius that even at a very young age, you already know what you like to do. Otherwise, I believe that prior to you finding your true passion, you got to have lots of exposures and experiences of seeing what the world is really like – trying, failing, and learning! Then you can understand your strengths and weaknesses and what you really like and dislike, and eventually what you really want to do in life. After you know yourself well, you have to be yourself. Since young, I had been very competitive. For not just one but a few sports, I use to be among the best in Singapore as a boy. However as I grow older and went through certain failures in lives be it in relationships, health or work, there was a time I started to wonder if I should continue to be competitive because it is really tiring. I am also known to be outspoken. I always like to tell the truth and share what I reckon can be beneficial to the people around me without any personal gain for myself. Not that I am a bleeding heart, but maybe this is just me. Of course I will know how to be tactful when truthful. Otherwise I will have long crash in my corporate career! Despite all these, reality bites and telling the truth can be hurtful to people’s feelings and bitterness may develop! Therefore so many times I asked myself why should I be so “kaypoh”? I also pondered this question with one very close friend. He told me that I should just be myself! For these are my traits that he like about me as his best friend. At different stages of our life, we may be faced with many important decisions to make. 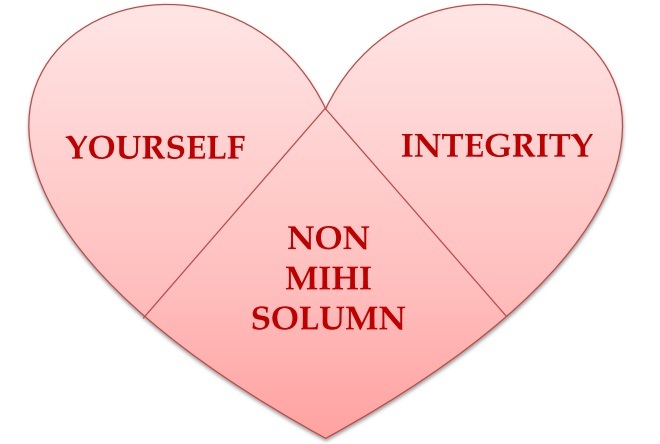 For me, integrity (right heart) is one that I can always safely fall back to if I am unsure. For example you may come across an opportunity that can make you really rich in a short time. 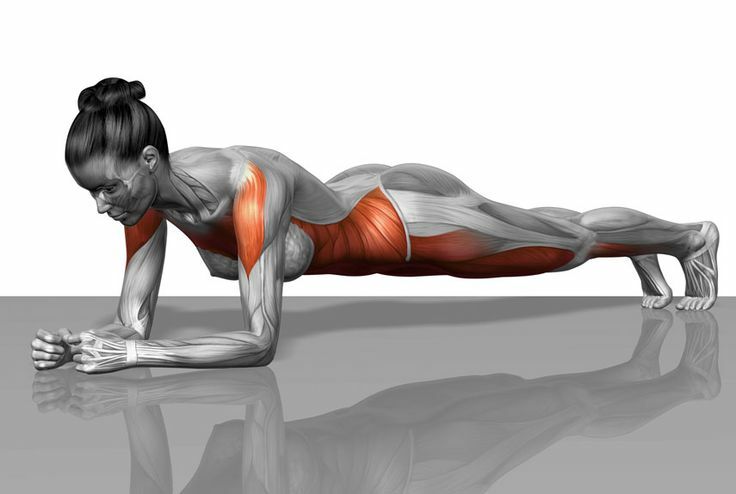 However this can possibly cause harm to others. Due to the money reward, we always try to convince ourselves that everything is going to be fine and no one is going to get hurt and we will be rich. This is despite the risk of causing harm to others can be high. In situation like this, if without a very strong integrity to fall back to, we can be distracted and choose the money-making decision. In corporate work environment, politics and back-stabbings are commonplace. Imagine since the beginning, you have always been so righteously naïve and eventually was back-stabbed countless times. The pain of being backstabbed may lead to a person astray. He or she may eventually also behave similar to those who backstabbed others. Instilling a strong sense of integrity can prevent this from happening. In my own scaling of corporate ladder, never once, my integrity in work is compromised even in the face of politics. The bigger picture for the benefit of the company is always my top priority. With these factors in mind, if those despicable political bastards play games with me, I will challenge them in their own den. I will make sure I will be strong and will not buckle. I will defend myself, and outsmart and outwork those who play foul. So many times in my career, I had repeatedly confronted and exposed those with hidden personal agenda with intelligently words. So far, it has always worked out well for me without me getting into trouble. Nonetheless, it is always tiring dealing with all these corporate b..s! Contrary to what many believe that in order to get promotions in the corporate ladder, the only way is to be vicious and step on others to climb, I believe instead on integrity, creating value and always putting the company interest as first priority. If the company do not think so, then there is no regrets to leave or being fired. Then it is the company's problem or loss, and you should be happy instead that you are leaving. As an ex-AJCian, I have stolen this value from our school motto and school song title. “Not for myself alone” is the most difficult value to adhere to. This is because it is almost embedded in the nature of human that for almost anything one does, he/she did it for the sake of benefiting him/herself first. Ok, exception is probably parents to their children. Yet, if we look at the history of mankind, all the “greats” had almost done things with primary intention of benefiting others more than themselves. For e.g. Do you really think Lee Kuan Yew did what he did just because he wanted a legacy and hand the wealth and power to his descendants? Or could it be he really wanted this nation to prosper so that all Singaporeans and their future generation have better lives. I believe it is the latter. If it is the former, it will not last eventually. Gandhi led nonviolent civil disobedient with the main intention to inspire movements for civil rights and freedom across the world rather than just for his own personal agenda. Steve Jobs wanted to change the world by offering the best innovative products to the consumer. He did not create iphone just to improve his own life. Mark Zuckerberg started facebook with the mission of connecting people and not just for his own life to be better. Alibaba Jack Ma no longer feel is his mission to serve his company only, but instead mentioned he is carrying the responsibility of Alibaba to serve the society. Bill Gates and his wife could have just donated portion of their fortune to the charity and then enjoy their lives around the world with the wealthiest lifestyle one can ever imagine. Instead, they dedicated not just money, but their mind and time to charity, helping poorer countries (such as Africa) to become a better place to live in. In 2014, to raise awareness, Bill Gates drank water which was "produced from human feces" or produced from a sewage sludge treatment process called the Omni-processor. Now…. let us take a good look at most of the online financial courses today promoting about how they are going to change your lives with guaranteed double-digit % return per year. Then take a good look at financial bloggers promoting how well they did in their investment portfolio with only lip service justification. Also take a look at all the enrichment classes which promotes that your child will be transformed from a “C” to “A” students in no time with minimal effort! For most of these companies/people (not all though), I am skeptical if their TRUE intention is really to help others or to only to help them to become wealthy as top priority. Using our gut and sensitivity, it is not that difficult to tell. But first, we must not be only masked by the short term monetary gains! 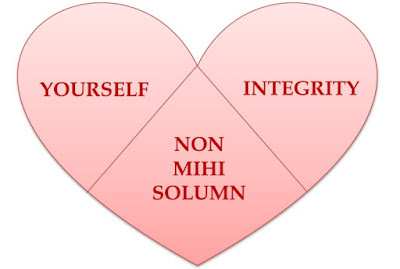 Undoubtedly “Non Mihi Solum” attitude will take a much longer time to bear fruit, because it will take time for people to finally realize your true good intention. Furthermore it will be painful initially because others may take advantage of your kindness. Nonetheless, I believe this is one of the most important values towards the route of true “enlightened success” in life. It is obvious that just these three values are not all sufficient to be successful in life. There are so many other traits needed. The most important also being love or passion as I mentioned earlier, although this is already said countless times by many others. Other values such as hardwork, perseverance, failures, recovery, patience, positive mind, forward thinking and looking etc are all very important. These are just my very own Three Core Values which hopefully will form the foundation of my own success in time to come! Believing it strongly the above will likely to be married with kids. LOL! Actually to defend those single, it is not always true la... because my best friend is single also and he is definitely not a selfish guy. On the contrary he is so helpful to others. Just that he believe so strongly that he forget to help himself first! LOL!!! The only problem is he is so engrossed and engaged in his routine lifestyle that he did not break his comfort zone to go find his next half. I admit it is not easy when it comes to this, but also cannot entirely leave it to fate, I always tell him. You must find ur own happiness! A leopard is a leopard. A chameleon is a chameleon. There must be some reasons why? Doesn't matter what others behave, just be yourself. Being yourself, you will naturally relax - finding relaxation you will naturally glow with "halo of peacefulness". And the people around you will feel you too. But how to practise the "art of relaxation" 7 to 11.
i am speaking from experience when i was practicing Taichi meditation for a few months only. Somehow the people around you react to you in a relax manners too. Wow... taichi is cool! I will love to do that one day! Actually martial art is a good way to unleash the true you beneath. Yes.. always feel relax reading your comments. Thank you! Your 3 values suddenly reminded of my secondary school principal saying to us : " do not hurt yourself and do not hurt others." Maybe the values when we learn from young is the most direct and relevant, but somehow as we grow up it is forgotten as we strive upwards in the society. Your third values are big there because its no longer about a person but for the good of the larger pool of people, a sacrifice that is priceless and intangible. Yes, although I heard someone say to me before that when u do charity it can be selfish because you just wanted to make urself feel good! Duh! Haha... funny idea, which I dun 100% agree. Most important is the heart must be upright. I realise over the years aside from the greats, but also people around me, those less selfish one eventually almost have better ending in terms of career and family balance. No doubt, I had seen many very selfish people climb in corporate or become rich, sometimes u say life is unfair. But eventually either their health is affected, or they have family or kids problems, or they will ultimately lose a huge chunk of their wealth. In other words not happy eventually if selfish! I can sense you definitely belong to the selfless camp and a nice person as well.